Both the black & white color trend and animal prints are hot for spring, so we found a shoe that highlights both these must-haves in one. You can't deny that you're going to want this DV by Dolce Vita Ferris Pump. 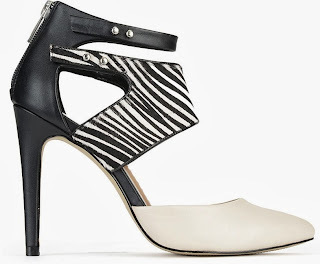 This two-piece, statement pump features a Zebra-striped calf hair upper, a black leather ankle cuff with cutout details, a white leather toe box and vamp, demure pointed toe, back zip closure, a comfortable 4" heel, and an amazing sale price of $59.99. Sizes are going fast so get yourself today's shoe of the day HERE.